On our Facebook page, we have made mention of several of the games we enjoy going digital as programs and apps for our computers and handheld devices. When I first began to notice this trend a few years ago, I was hesitant. I mean, I play board games for the ‘on the table’ experience and to gather other people around the table. Why would I want to play on a small screen where it’s pretty much impossible for us to all see it at the same time? However, as I’ve traveled, I’ve begun to pay better attention to the pros and cons. There are a few obvious benefits – the price is often MUCH lower, and the app is usually a much more portable version of some of the more complex games. You may also enjoy using the app as a way to teach yourself the rules before you introduce it to your gaming group. There are so many different mechanics, themes, and playing experiences that it’s impossible to provide a blanket statement about whether or not you should play on apps or with traditional components. So which option works best? In this feature and some subsequent follow-ups, we will talk about our playthroughs with the apps and compare to the more traditional version of the game. With our insight, hopefully you will be able to determine which gaming experience would work best for you and your family. This week, we’ll start with one of the more popular board games out there. Note: I use an Android device, so my gameplay experience may vary slightly from yours if you have an iOS device. I would recommend that you do a little extra research before you buy to make sure you get what you want. Ticket to Ride has become a staple of our hobby since its release over a decade ago. There are dozens of versions and expansions that you can get your hands on, adding new maps and new mechanics to an already solid gameplay experience. In the standard version of the game, 2-5 people can play together on one large board, using lots of little plastic trains and a big stack of small cards with several different types of railroad cars. It takes up a good bit of space, but all the components are well made and the art is very well done. The app has been around for a while, and it is very well made. It holds strong to the theme of the game – the opening menu looks like a platform, train whistles pop up from time to time, and and everything has a nice steampunk wash to it. You have the option to play against AI or online opponents, or you can use a ‘pass & play’ feature by which multiple people use the same device, passing it between them on their turns. Recently, a feature has been added so that if you and several of your friends have a copy of the app, you can each play on your own device. This addition, along with other recent updates, have made the overall experience even better than it was when I bought it a few years ago. You can also buy several of the expansions to play with in the app, though they each cost about as much as the app itself. The interface of the game is very good. The whole map can squeeze onto the screen, and you can zoom in and out. On the left side, you’ll notice some facts about each player – the number of cards, tickets, trains, and points that they have. On the right are the current cards available to take, as well as your tickets. On the bottom are the cards currently in your hand. It’s a bit crowded, but TtR has a lot of info to keep up with. There are a few features of the app that I like. If you notice in the screenshot above, there are two cities that are highlighted. These are two cities from my tickets, so I can keep in mind where I’m trying to go. I kinda wish that you could see all of them at the same time, but they are still useful. The many different ways to play are also nice. Finally, I have to applaud the app developer for the continuous updates. They could have easily stuck with the app they had a few years ago, but they obviously showed that they care about their product and have continually invested time and energy. That’s something I’m willing to invest in. 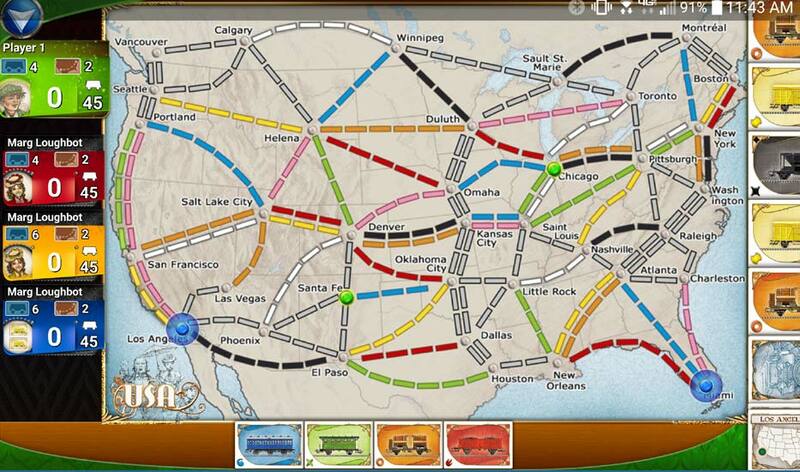 I think this serves as a nice companion to Ticket to Ride, but not a replacement. This is not going to be the same as plopping it down on the table, lining up all those little trains and cards, and playing for a game for an hour or so. However, if you’re stuck on an airplane for a few hours like Sarah and I found ourselves last month, then this is a great app to have on your phone. It didn’t take much explaining to get her to see how the app operated, and we had a good time with it. I also bought the Europe expansion to try that out before I considered making a purchase of the substantially more expensive board game version. I’m glad I did – while it’s fun, it wasn’t worth the cost at the time. Overall, if you’re a fan of the game and would love to be able to play it in environments not conducive to a big board, this will do the trick. VERDICT: Buy it, but after you buy the tabletop version.